If you give PowerPoint-style presentations, a digital projector can help your work look polished and professional. But in the past, a model matching the resolution of your laptop's screen and suitable for both work and play cost big bucks. Not anymore. The first wave of sub-$1000 units with native 1024 by 768 (XGA) resolution has arrived, a significant quality upgrade from the lower-resolution 800 by 600 (SVGA) products that dropped below that same price level last year. 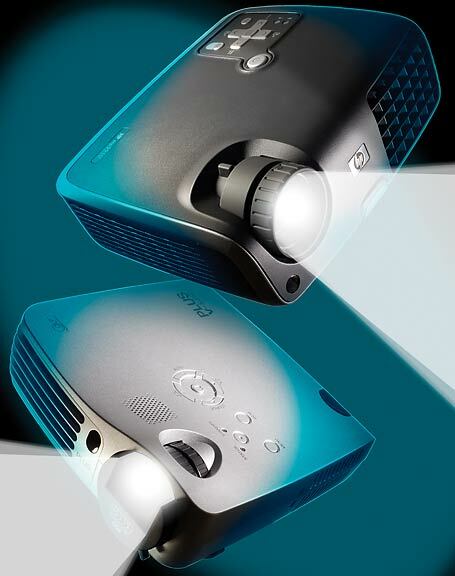 The Epson PowerLite 76c, the Microtek CX6, the Hitachi CP-RX60, and the Sharp Notevision XR-10X--all of which make our chart--are versatile portables that match up well against our top-rated projector, the NEC LT35, at less than half the price. These lower-cost newcomers may not have all the extras you'd find on a high-end business model like the NEC, but they do offer a reasonable mix of power and performance, whether you want to deliver a presentation in a conference room or view DVD movies in the family room. Ultraportable, light models from HP (top) and Plus Vision. The 16 projectors we corralled for this roundup represent a range of shapes, sizes, and designs. The smallest we reviewed are two sub-3-pound models: HP's diminutive MP2210 (which finished in tenth place) and Plus Vision's slender, seventh-ranked V-339. The heftiest products, at 8.6 pounds each--Canon's Realis SX50 and Sharp's XR-10X--are over twice the size of the supercompact ones. Each supports native XGA (or higher) resolution and weighs less than 9 pounds. And while none of these models is intended strictly for home theater use (see "Home Theater Wonders" for more), all of them may be used for at-home entertainment as well as for work.